© Loch Ness & Morar Project. The spring of 1983, marks the fiftieth year of speculation concerning Loch Ness. In this special composite report, the Project attempt to put the record straight about various basic aspects of the loch, drawing upon eight years of fieldwork. We can hardly find the anniversary a cause for celebration and mark the occasion with an apology that the enigma remains. A short history may help to explain why. It will be apparent that we are the most sceptical of the investigators but, having established that there is nothing impossible about "Loch Ness Monsters" from a scientific point of view, we feel that we owe it to the many eye witnesses to follow the trail to the end. Last year, repeatable sonar contacts seem to confirm those of other expeditions, particularly Birmingham University in 1968. It should be possible to discover what they might be. 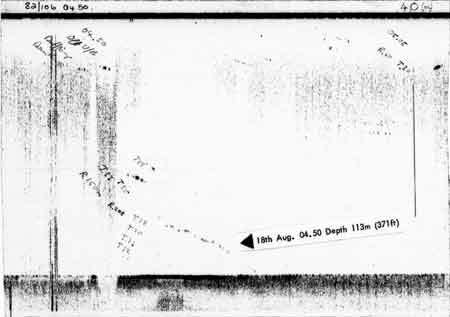 Two strong sonar targets on a paper trace obtained at Loch Ness in 1982. Fifty years ago in 1933, the world was made aware of the possibility of "monsters" in Loch Ness following the road improvements along its north shore. However, Highland folklore has long referred to a "water horse" in several Scottish lochs. Reports describe hump‑backed animals, particularly in Loch Ness, Loch Morar and off the west coast of Scotland. Loch Ness remains a large, scarcely explored, region of the British Isles. Almost 23 miles long, it could comfortably immerse every member of the human race on earth three times over and the London G.P.O. Tower would be submerged by its 750 ft. depth. This exceeds the depth of the seas surrounding our shores until clear of the Continental Shelf. The loch is connected to the sea via the short River Ness and was once closer to sea level than it is today. Though the deep waters are scarcely explored biologically, we know the loch to be capable of sustaining a population of quite large animals. Finally; thousands of people since 1933 report seeing large animals. Bearing in mind the volume and persistence of eye witness testimony, it seems only fair to investigate at least until methods capable of resolving the matter are applied. In the 1930s, a decade before sonar and the aqualung, no such methods existed and it was not until 1962 that organised investigation began. Shore based surveillance in the 1960s was discontinued having established that the rare material produced was quite inadequate scientifically, In the 70s passive underwater photography was thwarted by peaty water. Sonar, however, is more promising. Teams from Oxford and Cambridge, Birmingham University and Vickers Oceanics have all recorded contacts of interest. In 1982, the Project repeated these results. Through the efforts of our volunteer members we mounted day and night sonar patrols over a four-month period and made no less than forty contacts of interest. They were both stronger and deeper than the known fish and on occasions appeared to move. If there are large animals present, then this is how they would be recorded. Given the repeatability of contact, it is now possible to move towards resolving the matter of what they might be and in future years this is the cause the Project will be following. This will be achieved by, in addition to the mobile patrols, establishing fixed stations to provide more accurate tracking and plotting of target movements. We shall also begin the active deployment of underwater cameras, both T.V. and stills, linked to sonar. Other work includes a general scientific programme in collaboration with Royal Holloway College, with emphasis on life present in very deep water. Volunteers monitor the equipment in relays throughout the 24 hours, either ashore or afloat. No technical qualification is required; simply the willingness to learn the simple procedures and to work as part of a team. We recognise that members are making their holiday time available and the rota system allows "time off' to explore the surrounding area. To cover expedition running costs, members contribute a weekly sum (£54 in 1983) which includes all meals and accommodation, either in a tented base camp or aboard chartered vessels. Applicants should provide themselves with a sleeping bag and waterproof clothing. The Project shall run continuously from a date to be announced (usually early June). Applicants should complete the form with this report and enclose a deposit of £30 per person/per week, the balance to be paid on arrival. Joining instructions will then be sent. The deposit will be refunded immediately should a place not be available. If contributions are to be greater than £54 per week, immediate notification will be sent. Britain's first freshwater biological station was established at Lake Windermere in 1931. Net and jam jar work was scarcely underway when in 1933, a decade before sonar and the aqualung, the world was confronted by "monsters" in Loch Ness. Little was known about the loch, save from Sir John Murray's Bathymetrical Survey of the Scottish Lochs (1902-1908), which though basically a sounding exercise, included the first biological observations to be made there. Fifty years passed before the resumption of work as part of research into the mystery. Lack of information on the deeper Scottish lochs has laid the subject of the possible inhabitants of Loch Ness open to varied speculation on both sides of the controversy. The following comments on aspects of relevance may help to set the record straight. Loch Ness is a glaciated tectonic lake lying within the Great Glen fault line. It is 35 km. long and about 1.6 km. wide with steep sides sloping to a flat bed, interrupted only by silt outfall from the River Foyers, which divides the two deep basins of 220m. depth. The maximum depth of 230m. is considerably deeper than the seas surrounding our shores and places Loch Ness second in depth only to Loch Morar (310m.) among British lakes. However, its fault line origins give Loch Ness the greatest mean depth of 130m. All these depths were determined by the Bathymetric Survey using a Kelvin wire sounding machine and the Project have always found them reliable. They are disputed only by a sonar depth of 297 m. recorded by Vickers in 1969. A careful search of the reported area by the Project in 1979, using a Kelvin Hughes MS48 hydrographic echo sounder calibrated on site in accordance with survey practise, failed to find depths greater than 220 m. A partial explanation may lie in the fact that echo sounders calibrated for seawater over‑read slightly in freshwater. Echo sounding is also responsible for an erroneous impression given on chart traces that the loch walls continue down 1,000 m. or so beneath a loose sediment filling. The effect is known as "side echoes" and a frequency of 10kHz. or less is required for true sediment penetration. Loch Ness is quite spectacular enough since its volume of 7443 x 108 cu.m. is greater than any other British lake and could comfortably immerse every man, woman and child on earth three times over. It must be agreed that there is enough room to conceal a few mysteries as well! Clues to how a species could have entered the loch in the first place may be sought in post‑glacial history. Ten thousand years ago the ice began its last retreat from Loch Ness. Melt water temporarily raised the sea level rendering the loch more accessible. Subsequently, relieved of the weight of ice, the land rose and the loch level is currently 16 m. above sea level. A core sampling programme was mounted by the Project to discover whether or not the sea actually entered either Ness or Morar post‑glacially, since silica cases of marine or freshwater diatoms endure, locked in the sediment. Using specially designed apparatus, 2m. cores were extracted from Loch Morar (9m above sea level) and 4 m. cores from Loch Ness. Clays are to be found at the seaward end of both lochs but their basins are covered with black lake sediment to a depth of at least 4 m. in the case of Loch Ness. A core from Morar was found by Dr H.J.B. Birks of Cambridge University to contain abundant cysts of marine algae, providing good evidence for post-glacial invasion by the sea. So far, no evidence of an actual marine transgression has been found at Loch Ness. Both lochs are, of course, still "connected to the sea" via the rivers which drain them. A 2m. Morar core is thought, on the basis of pollen content, to have penetrated over 5,500 years of sediments giving a good idea of deposition rates, and, incidentally, places theories of 1,000 m. of Loch Ness post‑glacial sediment in perspective. There is no convincing foundation for speculations concerning ancient constructions, since there is no evidence that the loch level was ever much lower than it is today, or of submerged caverns, subterranean connections and the like. Next in the consideration of the habitat comes the food chain. It must be admitted that primary productivity is low. High latitude and frequent cloudiness reduce sunlight to a short growing season. Photosynthesis is further limited to a shallow photic zone of about 6 m. by suspended peat. The hard rocks of a steep catchment yield few nutrients to fast flowing rivers entering the loch. Thus the phytoplankton crop is low and the characteristic desmids poor in variety. This limits the herbivorous zooplankton (including Diaptomus Cyclops and Daphnia sp.) and in turn the larger predators (Leptodora, Polyphemus and Bythotrephes). Bottom fauna consist mainly of insect larvae and Pisidium (pea mussels). High acidity (pH6-6.5) slows bacterial decay of organic particles entering the loch and hence the release of their nutrients. Rooted plants are restricted to within a depth of 3 m. around the shore. In spite of all this, echo sounding reveals an abundant fish population over the entire surface area to a depth of at least 30m. The resident fish consist of brown trout, char, eels, a few pike and stickleback. Insects falling into the water during the summer provide a substantial proportion of the diet of trout. Quite independent of primary productivity is the influx of migratory salmonids prior to spawning. Salmon and sea trout enter throughout the year and may remain up to ten months before spawning, during which time they do not feed. Only during their first two years as parr are they dependent on the food chain. Weighing but a few ounces, they then leave and spend one to five years at sea, before returning, weighing up to fifty pounds. This must be considered a great bonus to the food resources available to any larger creatures. Loch Ness offers the compensation of stability as a consequence of its low productivity. The great body of water remains at a uniform 5.6oC throughout the winter preventing the formation of ice. As summer advances, a layer of warmer water (12oC at the surface and falling with depth), termed the epilimnion, separates from the hypolimnion beneath, which remains at 5.6 oC. The thermocline is the boundary layer of sharp temperature change. In a lake, photosynthesis is limited to the epilimnion, where the depletion of nutrients cannot be replaced from the hypolimnion until mixing occurs in winter. In productive (eutrophic) lakes the decay of organic matter falling from above, robs the hypolimnion of oxygen to the detriment of life present there. In less productive (oligotrophic) lakes such as Loch Ness, the hypolimnion does not become oxygen depleted. Therefore, the ologotrophic nature of Loch Ness offers usable and stable living space throughout the year. High oxygen levels permit life to extend to the deepest parts of both Ness and Morar. The abyssal region of Loch Ness is inhibited by a community of animals, illustrated by a recent collection (Sept. 82) from the deep basin floor, at a depth of 220m. The profundal benthos live in a stable world of great pressure (22kg/sq.cm. ), unchanging low temperature (5.5oC) and constant darkness. There is no shortage of oxygen however. The species are typical of lake beds but it is interesting to find them at this depth. A similar collection was made at Loch Morar at a depth of no less than 300m. Pisidium conventus, a tiny mollusc or 'pea-mussel' is a relict of the loch's Ice Age past. It is an arctic species and only found at these latitudes, in the cold water of deep lakes or at high altitudes. Chironomids are midge larvae. It is not known how, or indeed if, they manage to reach the surface and emerge as adults, through a water column of a height greater than the London GPO Tower. Some chironomids are known to be neotenous. No less than 15 of the same species were taken in a haul by a sampler which skimmed the mud from an area of 0.1m2 . Three char were also taken from the loch bed at 220m., which deepest that fish have been caught in British freshwater. The Project first observed fish on the loch bed in 1981, with an underwater T.V. loaned by Tamtech Ltd.
Char, a salmonid, are another relict species and known to swim deep. They are probably the fish observed by echo sounder in the open water, at a depth of 30-60m. In Windermere they are known to feed on zooplankt­on and sometimes chironomids. So far, it is not known whether char present on the bed of Loch Ness feed on the bottom fauna. Only one specimen contained matter in the lower gut on capture. This con­sisted mainly of Bythotrephes, a large predatory member of the zooplankton. A few observations on the condition of the deep water sediments are also relevant to some perennial theories explaining "monster" sightings. Gas rising from the loch bed has been recorded only in the shallower water of Urquhart Bay. Here it is possible to provoke the release of small gas bubbles by dragging grapples or dropping boulders. The resulting bubbles can be observed rising by echo sounder but are seldom visible at the surface. The mud of the deep water contains few gas producing bacteria (Cambridge University 1962) and resists all attempts to provoke gas by the means above. Freshly extruded cores show no signs of gas and nor does underwater television when towed through the sediment. Underwater television, extensively used in the deep water, has failed to reveal any rotting vegetation or tree trunks. Logs are to be found in the shallow waters, Urquhart Bay and, as would be expected at Lochend and Dores, having drifted with the prevailing wind. It is hoped that no further speculation on alternative causes of "monster sightings" shall visualise Loch Ness as a stagnant pond. On the contrary, Loch Ness is a very large and scarcely explored environment offering stable conditions and, despite appearances, considerable food resources. Most of the fish arrived from the sea and many still migrate to and from it. Access would once have been even easier. The presence of a large fish predator is not in the least surprising. The problem is that people report seeing one they do not recognise. Highland folklore associates a "water horse" with several Scottish lochs. Descriptions of a hump‑backed, long‑necked animal in Loch Ness, Loch Morar and off the West Coast have been catalogued by Lt. Comdr. Gould (The Loch Ness Monster and others 1934), Mrs Constance Whyte (More Than A Legend 1957) and investigations since. In spite of the many causes of error, competently described by Dr Maurice Burton (The Elusive Monster 1961), the volume and persistence of eye‑witness testimony remains the most impressive category of evidence. Agreeing that Loch Ness could conceal and support large creatures, then surely it is justified to inquire until means capable of resolving the issue have been applied. So far this has taken fifty years. In 1933 there were no such means and by the time there were, the subject had lost its credibility. Loch Ness had become fair game for hoaxes and authors plaintively demanding "scientific investigation" were to become uncritical in the presentation of evidence. Working on the principal of the more the merrier, they had succeeded only too well. A series of widely differing photographs have appeared over the years and, in 1960, a film of a moving object by Mr. T.K. Dinsdale. Encouraged by these "classic" pictures, the LNI (The Loch Ness Investigation, 1962‑72, founded by David James and Peter Scott) mounted intensive surface surveillance throughout the sixties. After a ten year war of attrition against the law of averages, the resulting films of interest, brought realisation that possible surfacings were rare, brief and exposed little to useful photography. None showed anything like the amount of body suggested by "the classics". Higher standards, introduced by Dr. Roy Mackal, revealed how photographs could be faked or mistakes made. The false trail ended and the LNI moved underwater. There followed a most significant collaboration between the LNI and Birmingham University, which deployed a digital sector scanning sonar in 1968. Results indicated objects moving at speeds of 3.3m/s. horizontally and 0.5m/s. vertically (Dr. Hugh Braithwaite, New Scientist, December 19th, 1968). Sonar had previously produced interesting results in 1962 when used by an Oxford and Cambridge University expedition (Dr. Peter Baker, The Observer, August 26th, 1962). Since then, Robert Love of the LNI, Klein Associates and Partech Ltd. have also reported successes. Unfortunately 1972 saw the cessation of LNI activities. In the same year, underwater cameras suspended from moored boats in Urquhart Bay by Dr.R.H. Rines, produced interesting photographs which, when computer enhanced, appeared to show a flipper like object. Other pictures followed in 1975. However, since they appear to be interspersed with shots of loch bed debris, they are inadmissible as evidence. Peaty water at Loch Ness had rendered photographic results ambiguous. Recognising these ambiguities, the naming of the Loch Ness Monster, Nessiteras rhombopteryx, by Rines and Sir Peter Scott (Nature, Dec. 11th 1975), was based on wider evidence and prompted by concern for conservation. Meanwhile in 1974, revived British effort had moved to the clear waters of Loch Morar (which had a similar sighting tradition established by the Loch Morar Survey 1970-72), hoping to solve the mystery at a stroke. The Loch Morar Expeditions began with manned observation equipment and progressed to underwater television in 1975. The objective was to record a full body profile by viewing upwards from beneath, against the backlit 90 o circle provided by the surface. In 1976, despite coverage a hundred times greater than conventional flash photography (which is limited by back scatter), no results occurred in three months of work. There followed a reassessment of the situation. Sonar made interesting contacts but could not identify them directly. Passive underwater photography had the potential to reveal essential detail but the unpalatable fact was that it could not be expected to make contact at all without a much sounder basis for camera deployment. The Project (The Loch Ness and Morar Project which had succeeded the Loch Morar Expeditions) returned to sonar and to Loch Ness, since its uniformity is more favourable to this work. The objective was to repeat previous sonar contacts and, in addition, to establish some pattern leading perhaps to active underwater photography. Hints to identity can also be gleaned from sonar contacts, especially if it is possible to track their movements. Before we could commence sonar monitoring it was clear that a substantial and rather specialised vessel was required. Patrols would be run both day and night covering the length of the 23 mile loch at slow speeds, as quietly as possible. The sonar equipment would have to be mounted in dry conditions and a crew of six accommodated, allowing for relief shifts during the 12 hr. period required to cover the distance at drifting speeds. The vessel should also be capable of supporting other equipment rendered desirable as the work proceeded, to launch and tow such equipment as cameras and to act as a general work platform. The Project had already developed a usable surface vessel system based upon 18 ft. inflatable hull units linked by custom built deckings on site. 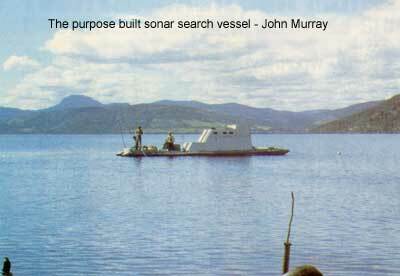 The sonar patrol vessel, "John Murray", was built with twin 40 ft. hull units and has a beam of 10 ft. These larger tubes were decided on, rather than tandem pairs of 18 ft units, in order to support greater weight, to improve performance by eliminating turbulence amidships and to give some longitudinal strength to the structure. Design of the decking and superstructure had to allow for dismantling and lifting by a crew of six if necessary. Therefore the deckings were built in 4 ft. sections (the width of a ply sheet) which bolted together with the joints sealed by mastic. Each section was framed with 4" x 2" timber with 3/4"ply sheets for the decks. Cabin sections are of 1/2" ply. Sections comprise 1) the foredeck, 2) the bridge, 3) and 4) cabin, 5) cockpit and section 6) includes the whole of the after deck with engine. Between sections 5 and 6, just abaft the cabin, a gap was left to allow the hull tubes to articulate thus avoiding the need to build in longitudinal strength sufficient for the whole length. The gap also provides an obvious position for the lowering of transducers. The whole deck is above the water line so the mounting of new equipment is easily arranged. The structure behaves quite well but is rather heavy. A draught of approx. 1ft. (not allowing for propeller and rudder), exposes the deck joints to the waves underneath. Some trouble was experienced in making these watertight. The articulation certainly works but the motion between the two halves is undesirable for some purposes. For example, when towing a T.V. camera close to the loch bed the camera moves due to the effect of surface waves on the towing vessel. It is hoped to produce a light, fully rigid decking in aluminium. The catamaran form has the advantage that the maximum beam and stability of the vessel is maintained along the full length of the hull. In a conventional boat it is customary to handle heavy weights at the stern, since it is here that the hull is often at its widest and most stable. Working from the bow or off the side, limits handling space and tends to capsize the hull. Unfortunately, work from the stern of most boats is complicated by the rudder and propeller. In the case of a catamaran, it is possible to use the bow for these purposes while the engine may be safely used for positioning. We therefore incorporated a 10 ft. x 6 ft. foredeck. Since we also wished to use the stern for lowering purposes, we placed the propeller and rudder 3 ft. inboard of the stern proper with a hatch for access in the event of fouling gear. The aft working platform extends over one third of the full length to enable large equipment to be carried. Since the vessel is required to operate silently, both under sail and while drifting, a special characteristic is needed. Ordinarily, a vessel not under power drifts uncontrollably, turning its broadside to wind and sea, which is a most uncomfortable position due to rolling. Our craft is required to run steadily downwind. To this end, the cabin structure is placed well forward to catch the wind, pushing the bow to leeward. To reinforce this tendency, two 5 ft. dagger boards were provided aft which gripped the water providing a fulcrum. The system operated perfectly in practise and we regard this as one of the most useful features of the design. When under power and heading upwind there can be, in consequence of the forward superstructure, a tendency for the bow to blow off course. This is compensated for, by a further pair of dagger boards lowered forward. In practise they were seldom needed. Power is provided by a 35 hp. Ford car engine, driving a propeller through a conventional shaft held in a special bracket. The four stroke system allows operation at low revolutions without oiling up as is the case of a two stroke. The car engine is cheap, spares are readily available and the mechanism and maintenance are within the scope of a higher proportion of our members than would be the case with a more specialised engine. Speeds of over 6 knots are obtainable. However, the electrical systems are not so desirable in a marine context and we would much prefer a raising propeller to allow for beaching. We had built a raising shaft but this would have complicated the structure to an unacceptable extent in the time available. A 24 volt lorry alternator was fitted to the engine to provide power for the sonar. Car batteries provide storage for 200 amp.hr. to allow for drifts. The system has suffered frequent breakdowns and attention shall be paid both to propulsion and charging, when funds permit. The rudder has a fairly large area (18" x 30"), is "balanced" and operated by teleflex from the open bridge. The vessel can turn within her own length. Since the loch runs NE to SW, it is in line with the prevailing SW winds. NE and other winds also tend to be channelled by the surrounding hills to blow straight up or down the loch. For this reason a square rig was decided upon which would permit running downwind with the minimum of adjustment. It is doubtful whether the hull form would produce an acceptable upwind performance with a fore and aft rig and tacking would render systematic searching difficult. Upwind work is performed under power. Though the sail itself was ready for the 1981 season, funds were not sufficient to rig it. In fact a very acceptable performance was obtained using the cabin windage alone. As already mentioned, placing the superstructure forward allows a large working and transportation deck aft and also orientates the vessel downwind when drifting. The design of the cabin itself was required to accommodate a crew of six, the instrumentation and the control position all in the smallest space and with minimum weight. An open bridge was chosen for the control position. An elevated deck, forward of the cabin proper, gives a good view all round which is necessary when equipment is being launched, towed or recovered. It also gives direct contact with work on the foredeck and affords the helmsman a downward view when following up cables. The bridge can be covered by an awning during rain. The blacked‑out sonar compartment lies below the starboard side of the bridge and it is intended that a perspex panel in its roof shall give the helmsman a view of the sonar screen. Steps from the bridge lead to the cabin below, which gives standing headroom and space for benches, port and starboard. Two "quarter berths" run out either side of a sheltered cockpit aft and there is additional sleeping space between the deck of the bridge. All berths are thus clear of the cabin space and permit internal changes to mount most equipment likely to be used. When underway, the arrangements permits two of the crew of six to stand down in the quarter berths, while at anchor watch a third may sleep beneath the bridge. The vessel is intended for 24 hr. use and during 1981 was "re-commissioned" every 12 hrs. Re-commissioning times were at 8 am and 8 pm to coincide with main meals which were eaten ashore. Additional food was supplied in insulated containers and a small gas burner provided for heating water. We believe that the combination of rotating manpower, tented base camp accommodation and custom built vessel, provide the key to true 24 hr. operation and an economic standing sonar patrol. There were over 150 participants in the 1981 expedition, including contingents from the W. Yorkshire Fire Service Sailing Club, The Royal Corps of Transport Sailing Club, Sea Cadets and Venture Scouts. The construction of the vessel occupied most of June and matters were then delayed for a further month through the installation of faulty sonar. Most of July was spent on an underwater T.V. survey of a crashed Wellington bomber, in collaboration with Herriot Watt University. An unmanned, remote control submersible, "Sea Pup", was used and our vessel proved adequate to support it. Throughout August, 24 hr. operation was achieved. This did much to show the potential of the sonar system we had selected but also served to demonstrate the importance of standard working methods and fixed procedures. Contacts of interest were gained but all were rated inconclusive. During the winter, we concentrated our attention upon designing contact procedures and calibration experiments. We also parted with tradition and decided to charter vessels in 1982, until funds permitted the improvement of our own vessel. In 1982, from the beginning of May to the end of August, two scanning sonars were operated for over 1,500 hrs. in day and night patrols of the deep northern basin. Selection of the deep midwaters as a starting point, was based upon previously mentioned results, rather than on initial biological considerations which might have suggested the inshore waters as more likely. In fact, the entire surface area was found to be well stocked with fish. Sonar work in midwater is easier and results are less ambiguous. Inshore exercises were attempted in Urquhart Bay but here, results are confused by the loch bed, mooring chains and boat wakes. 1. Deeper than the usual limit of the fish echoes recorded during echo sounding, which has been established to be 30 m. though may sometimes extend to 60m. 2. Stronger than the usual trace produced by fish. 3. Having movement (in this case vertical), not normally associated with fish. In establishing the lower depth limits of the fish population, the Skipper 603 echo sounder was used in a particular search for fish at great depth. The machine was used with full sensitivity and calibrated on a 3/4 lb. live trout, which barely registered at depths below 150m. It seems reasonable to suppose that fish significantly larger, are rare in the mid waters at this depth. Alpine char, of which three 1/2 lb specimens were taken from the bed of the deep basin (approx. 220m) would not register on the echo sounder at this depth. Weak fish echoes (apparently equivalent to the calibration fish) were occasionally gained at depths of 60 in, but the bulk of the fish population are concentrated above 20-30m. and are abundant over the entire area of the loch. We therefore established a rule whereby contacts gained below 30m. were tracked. The relative strength of contacts was judged in association with the above data and calibration. The sensitivity of the scanning sonars was reduced to the point where only the larger fish registered in the surface layers. The calibration fish was barely detectable at 25m. A further calibration using a 7.5" spherical air volume was conducted with the Furuno sonar, which has a colour display giving a relative indication of target strength. A fixed mode of operation was used. The vessels motored or drifted as near to the centre of the basin as possible, between Foyers and Urquhart Bay. The beam was normally scanned over a sector of 120o in the direction of travel, at a tilt of 30o ‑40o , giving an effective search to a depth of 160m. The course was corrected on the reception of side echoes, which are clearly identifiable. The range was set to 250m. with the loch bed registering on the side lobe. These contacts (1,4,7,10) made with a Furuno 106A sonar, are among those gained early in the season, on May and June. The are presented here since they introduce a new factor. The presentation of contacts on a cathode screen has the same function as on a paper trace but the record is preserved on magnetic tape. the main difference lies in the presentation of these traces in colours related to their strenghts. The colour scale to the left of screen, shows strength declining at 3dB intervals, with the strongest at red, to the weaker echoes in the blues. With the traces presented, a recorded calibration is included on the right-hand side of the screen in pictures 2, 5,8 & 11. The calibration shows a 7.5 inch spherical air volume (float) at an equal range to the contact. Relative strengths may be judged from the colour scale. Living tissue reflects poorly, since it has a similar density to water. In fish, over 50% of the echo comes from the small, gas filled swim-bladder. In air breathers, most of the reflection would be from the lungs (normally nearly emptied on diving). The calibration sphere is therefore a very "strong" target. For the first three contacts a third picture (figure 3, 6, & 9) of the screen has been included, in which the relevant portion of the screen is expanded to cover the right hand side.This shows more detail and is particularly useful in differentiating single targets from fish shoals, which exhibit diffuse "tails", due to inter-reflections between individual fish returning at slightly longer ranges. The contacts appear to be single targets. 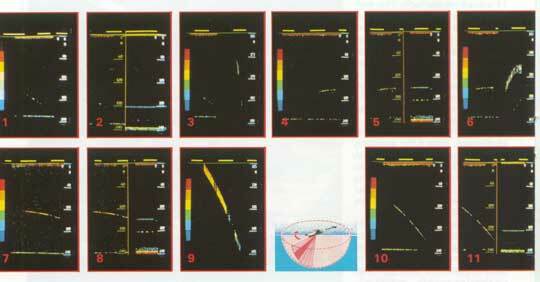 The sonar traces in 10 & 11 were obtained off Urquhart Castle, in the deep 720 foot basin, at 1725 on 16th May 1982. The target, was of demonstrably greater strength than the 7.5 inch calibration sphere to the right and was tracked for a total of 68 seconds, during which it appears to have dived from 69m to 114m (a speed of 0.8m/sec). Computations are only accurate if the target is in the centre of the beam and a safer measurement is based on only the strongest parts of the trace. However, this still indicates a vertical movememnt of apprx. 30m with the target lost at least a 100m (325ft) deep. We consider this contact to be of great interest owing to its strength, depth and probable movement. Contacts in excess of 50m. range (25-35 m. depth) were considered of interest and tracked for as long as possible, with the tilt angle noted on the Simrad slave chart prefixed "T". With the Furuno equipment, this information was entered on magnetic tape; the recording medium. Due to the inaccuracies of plotting ship's movements, any estimates of contact movements are confined to the vertical components and are based upon depths of target when gained and lost, together with tracking time (assuming target at centre beam). The Furuno sonar secured 12 contacts and the Simrad a further 28. They had consistent characteristics and no other type of strong echo was observed in midwater. The volume of contacts, compared to previous sonar searches, is not significant bearing in mind the operational hours which exceed those of all previous work put together (in deep water). Most contacts were beneath the deepest detectable layer of fish (60m.) but sometimes occurred within it. On some days they seemed absent from the area and then two or three detected in the course of the next patrol. The contacts appear to be single targets and of considerable strength, compared to the larger identifiable fish echoes and to a 7.5" spherical air volume. Some contacts appear to show vertical movement, though more work is required to show this conclusively due to the short tracking times achieved. It may be said that if there are large creatures present, then this is how they would appear. The following paper traces record some of the contacts made with a Simrad SY sonar in July and August 1982. The earlier traces show contacts significantly deeper than the scattered fish near the surface. Later, sensitivity is reduced and only the larger fish register, demonstrating contact strength. Contacts are indicated by arrows, giving date, time and depth. Depths stated have taken into account the beam tilt, which may be seen written on the charts, prefixed "T". The loch bed is registered by side lobes, not by the main beam. Though care has been taken from the outset, to eliminate alternative explanations such as inanimate objects and freak side wall returns, it is emphasised that pending specific work it is impossible to absolutely discount them. The importance of the results lies in the repeatability achieved since it will now be possible to resolve the nature of contact one way or the other.